Kanen Flowers describes himself as a “former technology guy” who got into filmmaking around 2001 with the goal of writing and directing his own material. In 2007, he started work on Jack Forgotten, a project that he says is still in postproduction. Other projects have met with greater success; he started the That Post Show podcast, and a show called That Media Show, and has produced a variety of shorts and web-based content through his production company, Scruffy.tv. 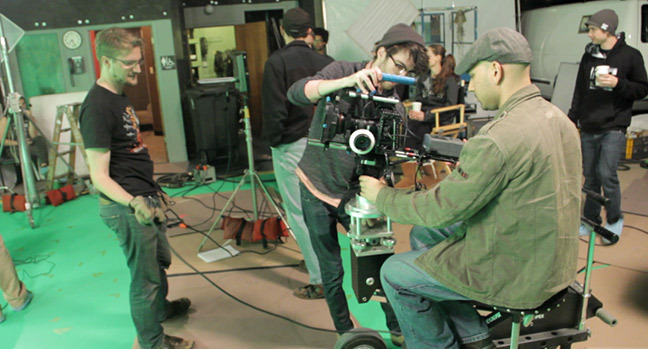 At the moment he’s working on Hero Punk, a full-length feature which was shot using the Blackmagic Cinema Camera. Hero Punk is unusual not just because it’s a low budget indie shot on a $3,000 video camera. 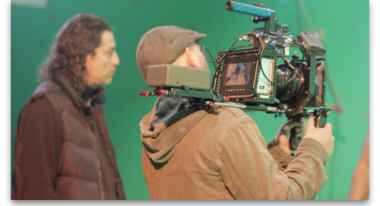 Much of it was shot on green screen and the visual effects work is being done by a variety of individual visual effects artists distributed around the globe. Filmmaker: What is Hero Punk? Flowers: Hero Punk is the first full-length feature film that we are producing in this new model of content creation. The idea is that we write, direct and shoot a film, and put it through a post-production pipeline that is distributed around the world. Right now Scruffy.tv has about 30 people from Australia to Germany. We send hard drives out, and use Dropbox so we can do post-production as a global team. Filmmaker: Half of the movie was shot on green screen? Flowers: Actually much more than half of it. Probably 70 percent of it was shot on green screen. Filmmaker: Most of your work has been done this way? Flowers: Right. We just released something on YouTube called The Dark Knight Descends, which is a parody of The Dark Knight Rises. It’s a 12-minute short that was shot 100% on green screen. Almost everything we do is shot in studio on green screen, and then we use different tools and technologies to comp in layers and add 3D backgrounds. Filmmaker: How did you choose the Blackmagic Cinema Camera to shoot this? Flowers: The short shows were shot on Canon DSLRs. We were looking around and trying to figure out how we were going to shoot this rather epic cyber-punk superhero film. We knew that it was going to be a tremendous amount of green screen with tracking markers, a lot of 3D environments, and a lot of compositing. We thought about the RED, we thought about all of these different cameras, but we played around with the Blackmagic Cinema Camera and it turns out that it had a couple of really great advantages. One was that we could use our existing lenses. But really the workflow was the big thing for us where we’re shooting straight to an SSD and then we’re handing that SSD off to an editor who is on set editing while we’re shooting. They’re not dailies, they’re more like hourlies. We’re able to make sure that we got the shot that we wanted. Because we’re delivering this in 1080p, we tested the Blackmagic Cinema Camera and the quality that we were getting out of it was much better than we expected, it was definitely sufficient for how we’re trying to put together Hero Punk. Filmmaker: Before this, were you shooting with a Canon 7D or a 5D? Flowers: We were shooting with a 7D mostly. Filmmaker: How did you find the difference in the sensor size? Flowers: My experience is primarily as a writer-director and as a visual effects guy, so that’s most of the way that I look at the world. Because it’s shooting to ProRes 4:2:2 at 10-bit quality, the footage that I was getting was significantly better than the footage I was getting from the 7D, just from a post-production perspective. The sensor size and the crop sensor and having to use an 11-18 mm lens and all of those different things are kind of weird where you have to check the focal length of the lens and multiply it by 2.4 to get the size of the lens it’s going to create. All that stuff is a pain, but because we were shooting on a green screen and because I’m interested in capturing the image and the tracking markers and the green screen in a way that I could do something with it, I just felt that the BMCC was far and away better than the 7D. Filmmaker: You were shooting with two cameras? Flowers: Right. We shot on two Blackmagic Cinema Cameras. Most of the time we had one on the dolly and one on the jib, and we did a lot of hand held stuff as well. Filmmaker: When shooting with two cameras, how were you using them? Flowers: We would do the master and then the reverse at the same time, or we would shoot different perspectives on the same scene. But there were other times when it was just slightly off because we weren’t 100% sure which angle we wanted, so we would just go 15 to 20 degrees off just to have the coverage. One; 19 minutes on a 256GB SSD. Secondly; it looks like crap. It’s grainy, it’s blown out, it’s horrifyingly bad. The third thing is; there’s not an NLE in the world that can support it. Even Adobe, who created the CinemaDNG standard, their stuff doesn’t support CinemaDNG RAW. So shoot ProRes. It looks good, it’s not blown out, it’s not grainy, but what’s amazing is you can blow it up to 2.5K and you get 2 hours on a 256GB SSD at 4:2:2 10 bit. Filmmaker: How many days of shooting? Flowers: The total number of shooting days was ten. Four of those were long days in the green screen studio, and then some of them were on location. Then we went back to the studio for a few half days. Filmmaker: How are you funding the film? Flowers: The entire budget for the film is $100K, and that gives us a finished film in the can. Sixty thousand of that we are putting in, and we are doing a Kickstarter campaign to get forty. Whether we raise that money doesn’t mean doing the film or not doing the film, it just means we are going to have to put more of our own money into it. Filmmaker: What is your post workflow? Flowers: On set we had an editor editing in Premiere Pro just to give us a sense of what was happening because that’s what they were familiar with. It’s being edited right now in Premiere Pro and in Avid. Filmmaker: Where did you find the VFX people you are working with? Flowers: These are people who are working freelance for Scruffy.tv and I got in contact with them primarily over Twitter and Facebook, and over That Post Show. I would say, “Hey I’m looking for people to do editing or visual effects or 3D or compositing,” and people would contact us. We spent all of last year building the production pipeline for the purpose of shooting something like Hero Punk. We did a lot of stuff just to get to know each other and to see each other’s skill sets so that when we started working on Hero Punk we knew what everyone was capable of. Filmmaker: What sort of effects are involved? Flowers: We did a ton of 3D modeling and much of the world that exists in Hero Punk is in 3D, created mostly in Cinema 4D. There’s some Maya, but mostly Cinema 4D. And we’re modeling and compositing a tremendous amount of the world, it’s ridiculous how much actually. Flowers: It’s mostly familiarity for the artists. A lot of these guys are really strong After Effects users and there’s a really strong affinity between After Effects and Cinema 4D users. I really like the attitude that the guys at Maxon have towards their customers, and I’ve been a Cinema 4D user for a while so it just kind of fell that way. Filmmaker: When do you hope to have a finished movie? Flowers: Our goal is the fall. I keep telling everyone October, but you know how these things are. I will be extraordinarily unhappy if it doesn’t happen this year.